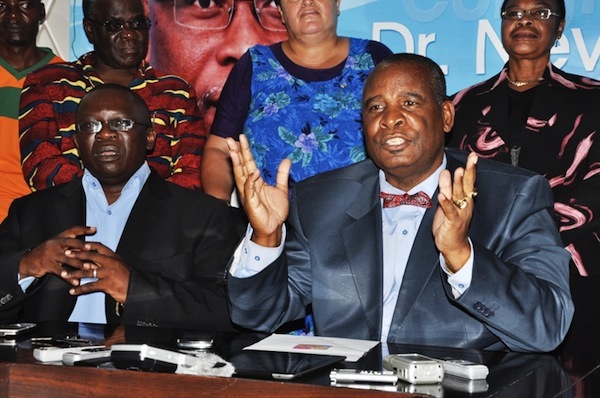 The opposition Movement for Multi-party Democracy says the two vice presidents, Dr Brian Chituwo and Michael Kaingu, had meetings with Post Newspapers Editor Fred M’membe and PF Secretary General Wynter Kabimba in an attempt to destabilize the former ruling party. party president’s office Muhabi Lungu has also revealed that he has been approached by the Patriotic Front several times to defect to the ruling party. Featuring on online based Cross Fire Blog Radio, Lungu said the party had irrefutable evidence that two of the leading officials in the revolt against president Nevers Mumba had been feted at State House several times. Lungu said party vice presidents Kaingu and Chituwo had confessed to having held clandestine meetings with Kabimba but had not divulged the details of the meetings. “We discovered that our two vice presidents (Kaingu and Chituwo) had been having meetings with Fred M’membe. Of course meeting Fred M’membe is not the problem but he has made it clear that he does not want the MMD to survive and he wants it obliterated,” Lungu said. He added: “We approached Dr Kaingu and he agreed that they had a meeting with Wynter Kabimba. When the UPND discovered about the meetings, the UPND refused to give details with the two vice presidents present saying we know your members as MMD have been meeting Wynter Kabimba and other people at State House. He said the PF had not relented in their quest to weaken the MMD and was approaching its members with promises of rewards. “We know that State House sent a vehicle trying to pick up Scorpion Kadobi and also trying to compromise Bowman Lusambo with promises of greater wealth telling them that now that you have been suspended we could do this for you,” he said. He said there were elements that were resisting the restoration of the MMD because some members were still obsessed with their former privileged status. “We lost an election and he (Nevers Mumba) has been trying to build a new image of the political party and some of the old habits have been fighting him. “I think that it is really unfair for them to blame him for the failures of the MMD, celebrate with him when we win an election and blame him when we lose an election,” he said. He said the PF had approached him several times to offer him positions. “I have been approached by the PF several times, I have been approached several times by the UPND offering great things,” he said. Lungu said the next MMD convention was due by April 2016 and asked members that were agitated to wait for that term. The MMD has been engulfed by a potential revolt led by the two vice presidents and Siliya who are believed to have been heavily funded to undertake the destabilization of the former ruling party.